This page provides links to the content management documentation. The documentation is presented as either web pages or as Microsoft Word documents that you can download to your computer. Next to each link is the date of the last update to the documentation so you can make sure you have the latest version. If the documentation is a Microsoft Word document, (MS Word) will appear next to the link. In addition, there are links to example pages showing how the different types of content display on the website. Enter your UVA NetBadge ID and and password. If you need assistance editing website content or have a question regarding using, sizing, or uploading images, please contact Elizabeth Mather, Eric Newsome, or Bridget Moriarty in the Communications Department. Their contact information is below. ​This page includes instructions on how to create a link to a file that's been uploaded into the CMS File Manager, a link to another page in the CMS, a link to an external website page, a link to an email address, and how to insert the Quote Callout into the editor. ​This document includes instructions for creating a new webform and placing it within a content page, configuring the confirmation, and inserting the CAPTCHA challenge into the form to protect it against automated "spam" submissions.The document also includes instructions for viewing the information collected by the form and how to export a copy of the information from the CMS as an Excel spreadsheet. ​This document provides reference information on each of the available types of form inputs (text field, text area, select list, etc.) and shows how to set up each of these fields within a form. Below are links to documentation on the page templates and callouts used to manage the content within the Advancement section of the website. The Advancement site uses two page templates and specially-designed callouts. The site also include specific menus to manage the links in the header and footer. Use the links in the left column navigation or the links below to access the documentation for the Advancement site. Below is a list of the file types that can be uploaded into the CMS. The list is of the file extensions. Only files that match one of the extensions can be uploaded. * For .xlsm docs, please contact the Office of Communications. I used an image in a page or callout and now I can't find it in the CMS File Browser. It's no longer in the folder I uploaded it into. What happened and how can I find the image? the CMS moves the image from the folder into which it was uploaded in the File Browser and places it in another folder in the File Browser. The folder that it places it in is under the "styles" folder. The exact folder into which the image is placed depends upon the page or callout in which the image was used. The screenshot below shows the CMS File Browser with the "styles" folder expanded to show the folders in it. 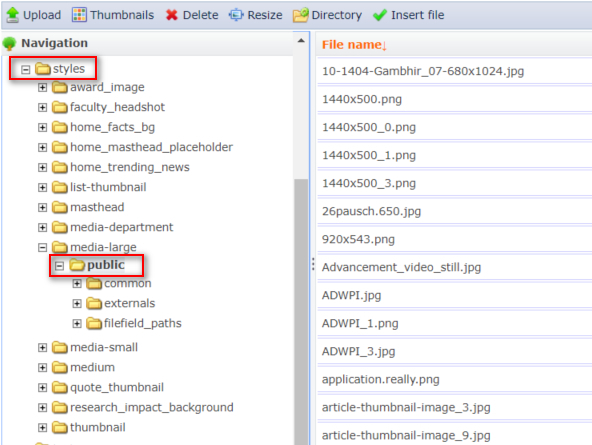 The CMS creates folders in the "styles" folder that match the types of pages that include file selector content areas. For example, there's a "masthead" folder for images used in the Masthead area of pages, a "media-large" folder for images used in Media callouts, and so forth. In these folders, the CMS also creates a "public" folder. This is the folder that you want to look in to find the image that you want to re-use in another page or callout. Below are links to example pages showing how different content items appear on a page. ​This document provides detailed instructions for setting up a faculty member to access the CMS and manage the content of the faculty member's profile page. ​This documents outlines the procedure for updating the list of file extensions that can be uploaded into the CMS File Manager by Office and Department Manager users. All Headings are in Blue Italic. Below are examples showing how each heading level (Heading 2 through Heading 6) appears.